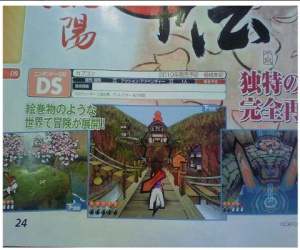 Okami to Hit DS in 2010! All together now - "yesssss!" Everybody loves a paintbrush-wielding white wolf game, but if there's on criticism we could level at the genre it's that there just aren't enough titles like the stellar Okami, released on Wii to great critical acclaim last year. Well, the genre is about to bulge again next year, with the announcement of Okamiden, scheduled to hit DS before 2010 is out. Whilst many players struggled with the Wii controls, the promise of using the DS stylus should ensure super accuracy with the old Celestial Paintbrush. The first screenshots - as shown here in a scan of Famitsu magazine - certainly look tasty, although reveal little about the game's locales. We'll hopefully have an official press release and update from Capcom themselves in the near future, but until then just dig into these scans and let us know your ideas in the comments below! Nice job on the article Prosody! I just found out about this a little while ago and I have to say that I am completely shocked yet extremely excited about this! Quite possibly the best news that I have heard all year! My thinking is that the game may be all touch screen based. Kind of like LOZ Phantom Hourglass. Although Phantom Hourglass did have an overhead view, and by judging the middle screenshot in the pic, this game does not look overhead. I’ll be interested on how the control scheme works. Wow; all I've got to say is I'm EXTREMELY EXCITED!! I think now’s the right time for an Okami sequel; so good job Capcom... keeping yourselves so secretive & surprising us like this! I think a DS sequel will be fantastic; for it might be a new direction other than on consoles… granted I did also want a direct sequel on the Wii! I rented Okami way back in November 2008; & from the little bit I layed I loved it from the start! I've also been contiplating long before then if I would like the game; so goes to show that I was impressed! You know, when I was just first looking at the scan; the middle picture kind of looks like that’s a guy! I took a closer look & it looks like the back of Ameritsu; did I spell that right, LOL?! And I’ve got to admit the graphics for this game will be pretty sweet if they’re part 2D like that! And I might be the only one who looking forward to this Okami sequel on the DS; for I think it’ll be a great new direction other than the console games! Sorry if this is a stupid question but what genre are you refering to in the article? Is it new or another remake? Never played Okami before. I was going to pick it up for Wii,but i didn't because Nintendo power suggested i try the ps2 version. Is it that bad on the wii? I'm guessing D-Pad plus touch control. Hopefully with an option for you lefties out there. I doubt it's an all touch controlled action game. It may not be THAT ambitious. I hope it's not all buttons and touch pad though. I'd hate to play traditionally only to have to get out the stylus every few minutes. cough GTA cough. I used own the PS2 version but didn't complete it. I bought the Wii version and thought it was a better fit for the Wii tbh. Loved it to bits. Same game or new one? I'd get it either way! Sweet, I might actually dust off my DS for this one. looks awesome, never played through the first though. It felt so lonely playing it lol. Might try it again before this is out. Never expected this, I was hoping for a sequel. Still, this is pretty sweet for DS owners. Genre is action-adventure RPG isn't it? "Zack & Wiki" is pretty much an all touch screen game and it worked great. "All touch screen" wouldn't really be "ambitous". Remember, it's hitting JAPAN in 2010. There's no official knowledge of it even heading over here, as nice as that would be. Sequel? If not then I'll have no need for this one, yea sure the controls are a bit a pain sometimes on the Wii but it plays fine other than that. I'm curious how (storywise) they're making another (unless its somehow a port) since Okami (Ps2/Wii) wrapped things up nicely. Oh, to anyone who's considering getting the original, I had no problems with the Wii controls. Now go get it. The only possible downer is that the original development team, Clover, were paid off by Capcom and are now doing other stuff as Platinum Games. But hopefully the Capcom in-house team can do this wonderful game justice on DS. It actually looks quiet good from the images. Hopefully it'll turn out great. struggle? speak for your self. I never had problem with the wii mote. I had problems with the game itself: heavy load in text, slow pace, and very very very very boring. Freaking sweet, stylus for the drawing...I am so there. I was thinking of how the stylus would be much better for this game when I was playing the PS2 version couple of years ago. Will this be a port or a sequel? I'm tempted if its a sequel, but if its a port then I'll stick with the Wii version which I already own. The controls are fine with the Wiimote. YEEEESSS!! The moment I've been waiting for has finally arrived! Day one purchase for sure! It's sad to see Okami on DS and not see Bahamut_ZERO. Too bad he's no longer around; I would have liked to see his reaction. On-topic: I may have to put this on my list. I've heard the Wii version is pretty great, so we shall see. After how horrible Okami was on the Wii, I think I'd rather dip my DS in a volcano than make it run this game. Some new info in a Japanese magazine! Chibiterasu? I'm sorry, but that's the most awful choice of name ever. And only three months? Then how in the hell does Susano have a son? I can't link you to it right now, but there's a article on Joystiq that says the dude on...Chibi is his son. So far, this is looking awful. I'm so pissed that people don't know about this game or don't appreciate it. This game is the poo!!! I have it both for the PS2 (beat it...twice .) and the Wii (beat once) and I think the controls are very easy. So...is this a sequel or a remake?